St Mary the Virgin is a Church of England parish church in Leigh, Greater Manchester, England. 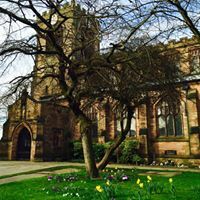 We are a member of the Leigh deanery in the archdeaconry of Salford, diocese of Manchester. St. Mary's is in the centre of Leigh by the Civic Square, which was originally the market place, next to the library and opposite the town hall. The church was mentioned in documents in the 13th century but the date of its foundation is uncertain. The first church on the site, dedicated to St Peter, was described as the Church of Westleigh in Leigh. Its dedication was changed to St Mary the Virgin at the end of the 14th century. The church straddled the ancient boundary between the townships of Westleigh and Pennington, the nave and churchyard in Westleigh and thechancel in Pennington. For several hundred years it was the mother church for the six townships, Westleigh, Pennington, Bedford, Astley, Atherton and Tyldesley, that made up the ancient ecclesiastical parish. For baptisms, marriages and funerals the population of the townships had to travel to St Mary's or else churches that lay outside the parish boundaries, such as St Mary's Deane, All Saint's Church in Wigan or St Mary the Virgin Eccles. The firstAstley Chapel was built as a chapel of ease and consecrated in 1631. A second chapel of ease dedicated to St John the Baptist at Chowbent was built in 1645 by John Atherton but not consecrated until 1723. A third daughter church, St George's Church, Tyldesley, was consecrated in 1825, St Thomas in Bedford was built in 1840 and Christ Church, Pennington in 1854. The early history of the church was linked with the Westleigh family who were Lords of the Manor of Westleigh. John de Westleigh was parish priest in the reign of King John (1199–1216). The church was probably rebuilt during the 15th century. The tower dates from about 1500. Achantry chapel dedicated to St Nicholas, known as the Tyldesley Chapel occupied the east end of the north aisle and the Atherton Chapel, dedicated to St Mary the eastern end of the south aisle. The tower was restored twice, once in 1721 and again in 1849. By the late-1860s the church had become unsafe. In 1871–73 the church, apart from the tower, was rebuilt by the Lancaster architects Paley and Austin at a cost of £8,738 (equivalent to £710,000 in 2016), providing seating for 710 people. James Fraser, Bishop of Manchester reconsecrated the building in February 1873. In 1890, the successors on the Lancaster practice, Paley, Austin and Paley, refitted the chancel, including the provision of an altar and reredos.In 1909–10 the same practice, then known as Austin and Paley, added a choir vestry to the north of the church, and recased the tower. 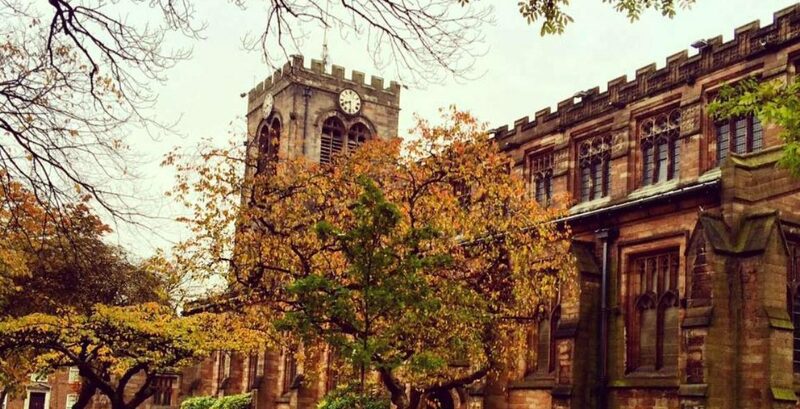 During the 1871–73 reconstruction the date 1616 was found on a roof beam but it is thought the roof of the St Nicholas or Tyldesley Chapel which was restored and reused dates from about 1500. Sir Thomas Tyldesley was buried here after his death in the Battle of Wigan Lane. James Irvine, vicar, was so anti "non-conformist" that he refused burial or blessing of those, including children, that had died and required a final resting place.